Cultivating and integrating the body, breath and mind, plays a key role in a multitude of practices developed over the centuries in China. Some had Daoist, Buddhist or Confucian roots; some were purely medical; some aimed to achieve spiritual connection, transcendence and even immortality; some prioritised maintaining health, curing disease and lengthening life; some were still and quiescent, prioritising meditation, breath training, visualisations, mantra recitations, sexual cultivation and internal alchemy; some were allied to the more physical realm of the martial arts, especially ‘internal’ styles such as tai chi (taijiquan). 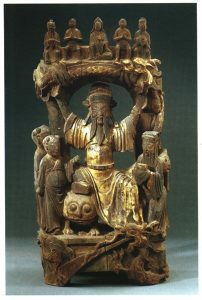 As befits this wealth of practices, a host of different names were used, for example daoyin (guiding and pulling), neidan (internal alchemy), neigong (internal skill), xingqi (circulating qi), zhan zhuang (standing meditation), tuna (exhalation and inhalation), lianyang (refining and nourishing) etc. Many of these practices were passed on in secret, handed down only to initiates or within families, and first came to light during the twentieth century. Since the 1950s, the name qigong has largely supplanted all of the above and can be considered as an umbrella term that embraces most of these varied traditions. According to French sinologist Catherine Despeux, “gymnastic exercises [i.e. daoyin/qigong] are a later development of original shamanistic techniques’. 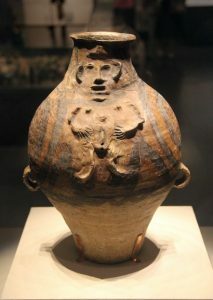 A seven thousand year old Neolithic pottery vessel from China’s Majiayao culture, unearthed in 1975, appears to bear this out, showing a figure in a qigong-like posture. Some historians think would have been used as a method for priest-shamans to enter trance states. 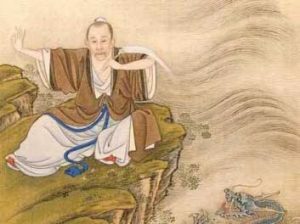 According to the Lun Yu (Analects of Confucius), to become a shaman required years of cultivation of concentrated and tranquil states. You must be firm, you must be regular [in this practice]. Their muscles will be supple and their bones will be strong. 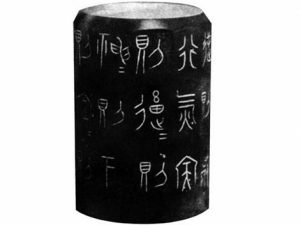 This jade block, thought to be a pendant or a knob for a staff and possibly of earlier origin than the Nei Ye, is inscribed with 45 characters, translated by Donald Harper as follows. “To huff and puff, exhale and inhale, blow out the old and draw in the new, do the “bear-hang” and the “bird-stretch,” interested only in long life – such are the tastes of the practitioners of Daoyin, the nurturers of the body …” . This tension between ‘active’ practice on the one hand, which ‘willfully’ directs the body, breath and intention, and utterly quiet, passive, ‘letting go’ practice on the other, runs through traditional Chinese health and longevity cultivation to the present day and both can be found within the modern-day practice of qigong . The Lüshi chunqiu (Annals of Lu Buwei), an extensive text compiled under the patronage of the Qin dynasty chancellor Lü Buwei and dealing with such varied matters as government, politics, education, warfare and agriculture, includes three significant passages. In the first, the link between shamanistic or ritual dances and daoyin is ascribed an ancient origin. “Once under the reign of Emperor Yao, the power of yin was in abundance, there were numerous stagnations and manifold accumulations. 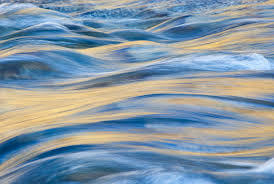 The ways of water were broken and obstructed, so that the flow was bad from the very sources. For the same reason, when the breath or energy of the individual is congested and stagnant, the muscles and the bones are contracted and don’t flex well. One therefore prescribes certain dances which guide the breath and ensure that it moves throughout the body in a harmonious fashion”. The second passage introduces an explanation of the benefits of physical movement that is repeated in many later texts. The third passage establishes the idea (to be repeated and amplified later in the Yellow Emperor’s Inner Classic and numerous subsequent cultivation texts) that if humans regulate their mind and emotions as well as their body, then neither external nor internal pathogens can penetrate or disturb the body to cause sickness. Among the many treasures found in a tomb at Mawangdui in south-central China (the tomb was sealed in 168 BCE and first discovered in 1972) was a silk scroll known as the ‘daoyin tu’ depicting figures practising various stretching and bending exercises. The term ‘daoyin’ refers to the art or skill of ‘leading and guiding’ qi to flow through the body by a combination of mental, physical and breathing practice. As explained above, the word daoyin is less commonly used nowadays and has largely been supplanted in the 20th century by qigong, literally the ‘gong’ (work or skill) of qi (vital energy). Around four centuries after the tomb scrolls were written, the great doctor Hua Tuo (credited with being the first person in China to use anaesthesia during surgery), is said to have originated a series of daoyin exercises based on the five animals: the tiger, deer, bear, monkey and crane. As Hua Tuo confirms, animal style practices were even then very old, probably having their roots in shamanistic dances. Despite the fact that his original form was lost, five animal qigong (also called the five animal frolics) is practised widely today. It offers all the usual benefits of qigong – a wide range of slow and conscious body movements allied with slow, deep breathing – plus a more ancient, shamanistic adoption of the physical movement style and character of the animal concerned. The crane, for example, is light and connects with the sky, air and the lung. It might perhaps be practised by those who feel too earth-bound. The bear, by contrast, is heavy, powerful, low-slung and deeply rooted and may help ground those who live too much in their heads. Yet again the tiger, fierce, brave and strong and associated with the Liver and Gall Bladder (considered the seat of courage in the system of Chinese medical correspondences) can help cultivate those qualities. The early emphasis on daoyin/qigong as a vital part of health preservation was continued through later health preservation texts. The 4th century Essentials of Nourishing Life included cultivating the body and practising daoyin exercises among its ten essentials – along with treasuring the spirit, regulating food and drink, and practising health-enhancing sexual arts. Speaking predominantly to the educated and wealthy it warned against laziness and advocated physical exercise, whilst simultaneously cautioning against the dangers of overuse of the body. Sun Simiao, one of China’s greatest ever doctors and popularly known as the God (or Buddha) of Medicine, devoted one scroll of his Bei Ji Qian Jin Yao Fang (Essential Prescriptions for Every Emergency worth a Thousand in Gold) to nurturing life, with advice on exercise, self-massage, cultivating qi and circulating the breath. Regarding physical activity he repeated the age-old advice of balance, moderation and learning from nature. 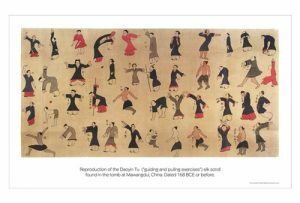 The 10th century text, Twenty-four Illustrated Seated Exercise Practices to Heal Diseases (Ershisi qizuogong daoyin zhibing tushuo), ascribed to the legendary Daoist sage Chen Tuan, offered 24 mvements with an account of their therapeutic effects. Each was to be practised during a given two week period according to the Chinese calendar, for example in the ‘Insects Stirring’ period of the second month, the practice was to make tight fists, lift the arms to elbow level and turn the neck to look over the shoulders to right and left 30 times. The Song dynasty (960-1279) saw the appearance of the Eight Pieces of Brocade (Ba Duan Jin) a qigong form that is widely and popularly practised today. It developed into a Northern hard style, known as Martial Ba Duan Jin, and a softer Southern style known as Literary Ba Duan Jin, which itself was subdivided into sitting and standing varieties. The standing form of the literary style is the one most commonly practised today. The Ming (1368-1644) and Qing (1644-1911) dynasties saw the publication of numerous texts on self-cultivation and health practices. Towards the latter part of this period, the three principal internal styles of martial arts (taijiquan, xingyiquan and baguazhang) developed, with their core training methods (neigong) sharing many similarities with the body-breath-mind integration of self-cultivation practices. It was not until the middle of the twentieth century that the term qigong – the ‘gong’ (work or skill) of ‘qi’ (vital energy) – began to be used to incorporate all of these traditions. And this fact – that the term qigong is used as an umbrella term for such a multitude of older practices – explains their enormous variety. They range from meditative sitting and standing, quiet breathing, visualisation and gentle movement on the one hand, right through to more powerful and strenuous exercises and even ‘hard’ qigong (e.g. 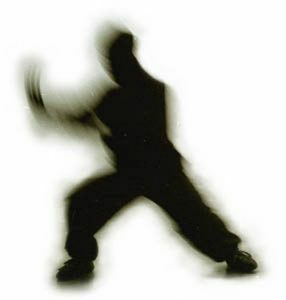 Iron Shirt Qigong – hardening the body to resist blows) on the other. Qigong, at least in its modern application, was born on March 3rd 1949, its birth announced by Huang Yueting, a communist party cadre in the Huabei Liberated area in North China. Surrounded by intractable health problems and lack of medical care, the local Communist administration had become intrigued by the story of Liu Guizhen – a young party cadre. After suffering from years of weakness, insomnia and gastric ulcers, he had returned transformed from a stay in his native village. He reported that he had been taught Inner Cultivation Exercise (neiyanggong) by an old master. Practising for 102 days by standing in silent meditation, regulating his breath, focusing his mind at the ‘Gushing Spring’ acupuncture point on the soles of the feet and repeating a simple mantra, Liu had recovered his health. With the support of the local Communist Party, he began to teach a method based on what he had learned. By advocating qigong as a medical practice divorced from any spiritual or religious context, while promoting its scientific basis, Liu succeeded in making qigong acceptable to the Party – at least for a few years. Soon he had opened teaching and treatment clinics in Tangshan and Beidahe and in 1953 he published the first ever book on qigong – The Practice of Qigong Therapy (Qigong liaofa shijian) which eventually sold two million copies. 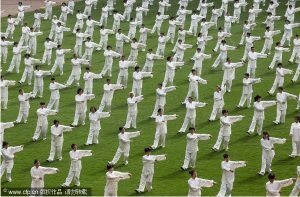 What happened to qigong in China after that – its fall and rise to become an extraordinary mass movement involving tens of millions of people – is an extraordinary and fascinating story, although space does not allow for a discussion of it here. A more detailed article by this author can be viewed below. . In Despeux, Catherine. 1989. Gymnastics: The Ancient Tradition. In Kohn 1989. 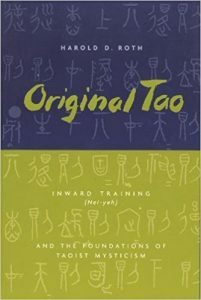 Roth, H. D, Original Tao: Inward Training and the Foundations of Taoist Mysticism. Columbia University Press: New York. p76. Harper, D, 1998. Early Chinese Medical Manuscripts: The Mawangdui Medical Manuscripts. Wellcome Asian Medical Monographs: London. Graham, A. C. 1986. Chuang-tzu: The Inner Chapters. Allen and Unwin: London. p265. This is repeated, more or less in, “Therefore, the authentic men in their roamings do not let their hearts be disturbed by puffing and blowing, inhaling and exhaling, expelling the old, taking in the new; bear lumbering, bird stretching, duck ablutions, monkey jumping, owl gazing and tiger staring – all that is for men to nourish the body.” Bromley, M et al, 2010. Jing Shen: A Translation of Huainanzi Chapter 7. Monkey Press. From Zhuangzi chapter 11, Zai You (Letting Things Be), translation from Liu, 2010, p39. Of course even ‘active’ practices (as compared to what Kongzi/Confucius called ‘mind fasting’ or ‘sitting and forgetting’) can be very internal and quiet and there are a host of techniques where the body is held still in standing, seated or lying meditation while one uses visualisations, special breathing methods such as inhaling sun or moon essence, and mental direction of qi flow to different regions of the body. As a general rule, quiet and still practice is considered to be more nourishing and more conducive to mental and spiritual development, while active practice is more moving and strengthening. But as the yin and yang of practice they inevitably overlap. Legendary Emperor, traditionally dated 2356-2255 BCE. Despeux, Catherine. 1989. Gymnastics: The Ancient Tradition. In Kohn 1989. p238. Knoblock, J, Riegel, J, 2000. The Annals of Lü Buwei: A Complete Translation and Study. Stanford University Press. Quoted in Kohn, L, 2005. Health and Long Life: The Chinese Way. Three Pines Press: St. Petersburg. p12. Kohn, L (2008). Chinese Healing Exercises: The Tradition of Daoyin. University of Hawai’i Press, Honolulu, HI, p49. In Stanley-Baker, M (2006). “Cultivating body, cultivating self : a critical translation and history of the Tang dynasty Yangxing yanming lu (records of cultivating nature and extending life)”. Indiana University MA thesis. Mafeisan – a preparation thought to have included cannabis and datura. Different five animal traditions relate the animals to other organs. The Yangsheng Yaoji (Essentials of Nourishing Life) by Zhang Zhan now only survives in fragments and mentions in other texts. Taiqing daoyin yangsheng jing (Great Clarity Scripture on Healing Exercises and Nourishing Life) quoted in Kohn, L (2008). Chinese Healing Exercises: The Tradition of Daoyin. University of Hawai’i Press, Honolulu, HI, p100. Despeux, C (1989). Gymnastics: The Ancient Tradition. In Kohn, L (1989). Taoist Meditation and Longevity Techniques, Centre for Chinese Studies Publications, Ann Arbor, MI, p239. Sun Simiao, On Preserving Life (Baosheng ming) in Kohn, L (2008). Chinese Healing Exercises: The Tradition of Daoyin. University of Hawai’i Press, Honolulu, HI, p134. Wilms S (2010). “Nurturing Life in Classical Chinese Medicine: Sun Simiao on Healing without Drugs, Transforming Bodies and Cultivating Life”, The Journal of Chinese Medicine, vol 93, p13. The combination of seasonal solar changes with the twelve lunar months gives 24 two-week periods essential for the agricultural rhythm of the year. Kohn, L (2008). Chinese Healing Exercises: The Tradition of Daoyin. University of Hawai’i Press, Honolulu, HI, p170. Tianjun Liu and Xiao Mei Qiang (Editors) (2010). Chinese Medical Qigong. Singing Dragon, London, p54. A traditional martial practice designed to strengthen the body so that it can withstand blows. Some hard qigong practices can be seen at the popular Shaolin monk shows, for example bending spears with the throat or having paving slabs broken over one’s head. Possibly his uncle, 5th successor of the Neiyanggong lineage. “My organs move, my mind is still”.